R.T. Smith, the creator and programmer of the fabulous Encyclopedia of War: Ancient Battles, created a trio of World War Two games a few years earlier for the Spectrum computer that were later converted to the PC: Arnhem, Vulcan, and Desert Rats. Right away with these three games you'd wish there was mouse support, but alas, the mouse had not yet arrived on the PC scene. Otherwise, for a game using a keyboard-only interface, you'll find it's still fairly easy and intuitive to play. Arnhem deals with the Allied campaign in the Netherlands to seize strategic bridges from the Nazis. This included the famous fiasco at the bridge at Arnhem (the "bridge too far"). Desert Rats renders the Italian Invasion of Egypt, the arrival of Rommel and the German Forces, and the entire North African war before the United States entered the scene. Vulcan concludes the North African campaign with the American storm and the final expulsion of the Nazis from the continent. The Three games are all built on the exact same system, but are not equally enjoyable, simply due to the military events they cover. For example, Arnhem and Vulcan are both significantly easier for one side vs the other. In Arnhem, it is much easier to play the Axis side, while in Vulcan, it is much easier to be the Allies. However, Desert Rats is better balanced as the North African War after the arrival of Rommel was very close. In conclusion, fans of World War Two must give Desert Rats a try. It's simply an excellent game. 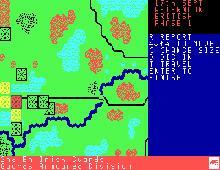 The other two are for those fans of the War who want to play campaigns that are not usually found in most wargames. So download Desert Rats today!